The campaign that would culminate in the Battle of Pea Ridge began December 25, 1861, with the appointment of Brigadier General Samuel R. Curtis to command the Union Army of the Southwest. Curtis’s mission was to destroy, or drive from Missouri his main opponent, Major General Sterling Price and about 8,000 troops of the Missouri State Guard, then wintering in Springfield. Hoping to catch Price when he was most vulnerable, Curtis launched his 10,500 troops during the bitter winter cold of early February, 1862. Outnumbered and ill-equipped, Price led his troops out of Springfield, south along Telegraph Road into Confederate held Arkansas, relentlessly pursued by the dogged and determined Federals. Skirmishes erupted daily as the two sides trudged south, often buffeted by freezing winds, rain, sleet, and snow. Reaching Cross Hollow Arkansas, Price united with a larger better supplied regular Confederate force commanded by Brigadier General Benjamin McCulloch. On February 17, the pursuing Federals slammed into McCulloch’s rear guard in the first Civil War battle in Arkansas, on James Dunagin’s farm near present-day Avoca. Bloodied, but not deterred, Curtis slowed his advance, allowing the now combined forces of Price and McCulloch to withdraw safely into the Boston Mountains near present day Hog Eye and Strickler. During their retreat, the Confederates burned their barracks at Cross Hollow and then ransacked the military supply depot in Fayetteville, burning several city blocks in the process, thus making Fayetteville the first American city burned during the Civil War. With the unification of Price and McCulloch, Curtis lost the strategic initiative. Two-hundred miles from his primary supply base, and with the Confederates increasing in his front, Curtis deployed his army to cover the approaches and prevent the enemy from reentering Missouri, then he settled down to wait. By the first week in March, Curtis’s livestock was so weak from food shortages that he feared he might not be able to transport his artillery or ammunition wagons if the Confederates made a sudden movement. Providentially, Curtis ordered the fragmented parts of his army to assemble on the bluffs overlooking the north bank of Little Sugar Creek just north of modern day Avoca. Dirt, rock, and timber breastworks were constructed, further strengthening an already formidable position. Meanwhile, Major General Earl Van Dorn was appointed to command all Confederate forces west of the Mississippi. Van Dorn assumed command of the newly christened Army of the West including all the troops under McCulloch and Price. Hoping to destroy Curtis’ army while it was still scattered, Van Dorn turned his army northward on March 4 during a late winter storm. Moving north to Fayetteville, and then up the Elm Springs Road, Van Dorn arrived at Bentonville the morning of March 6. There he encountered a small Union force of about 600 troops and cannon led by Brigadier General Franz Sigel. Sigel had been camped near modern-day Centerton, but had received orders from Curtis to consolidate forces along Little Sugar Creek. A running fight began as the rebels chased Sigel east out of Bentonville along modern day Highway 72, across I-49 near the Marriott and down into Little Sugar Creek valley. Sigel’s force rejoined Curtis late in the day, and the Confederate army bivouacked along Little Sugar Creek near Highway 94. Hoping to draw Curtis out of his strong position, Van Dorn led his army on long, difficult night march along the Bentonville Detour toward the Telegraph Road, squarely on the undefended rear of the union army. But as the sun rose March 7, Van Dorn began to realize too late that rapid marching in bitterly cold wet weather, coupled with food shortages had seriously crippled his army. McCulloch’s troops had fallen behind, and were still eight miles to the rear. Undaunted, Van Dorn pushed ahead with Price and the Missouri State Guard to open the battle, at the same time ordering McCulloch to rejoin him by a shorter route following the now obscure Ford Road. Responding to reports of enemy activity behind him, Curtis methodically began withdrawing troops from his earthworks to accept the rebel attack from the north. Union forces encountered McCulloch’s troops, including two regiments of Cherokee Indians, just north of the little hamlet of Leetown about noon. 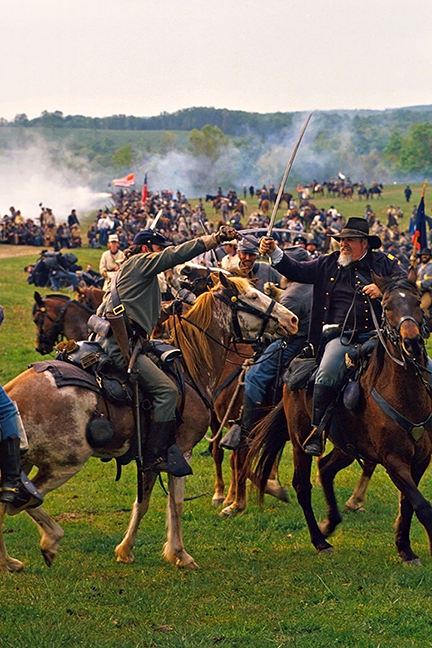 Fighting raged for at least three hours, including a savage and bitter struggle in a densely forested thicket known as Morgan’s Woods. The deaths of McCulloch and his second in command Brigadier General James McIntosh, coupled with the timely arrival of Union reinforcements decided the issue. Tired, discouraged, and beaten, the Confederates retreated in disorder. Two miles to the east another fierce battle raged as Van Dorn and Price with about 5,000 Missouri State Guard troops collided with about 2,200 young men fresh from the farms and small towns of Iowa and Illinois. Van Dorn had successfully flanked the Union troops by reaching the Telegraph Road to the north of Curtis’s position along Little Sugar Creek. 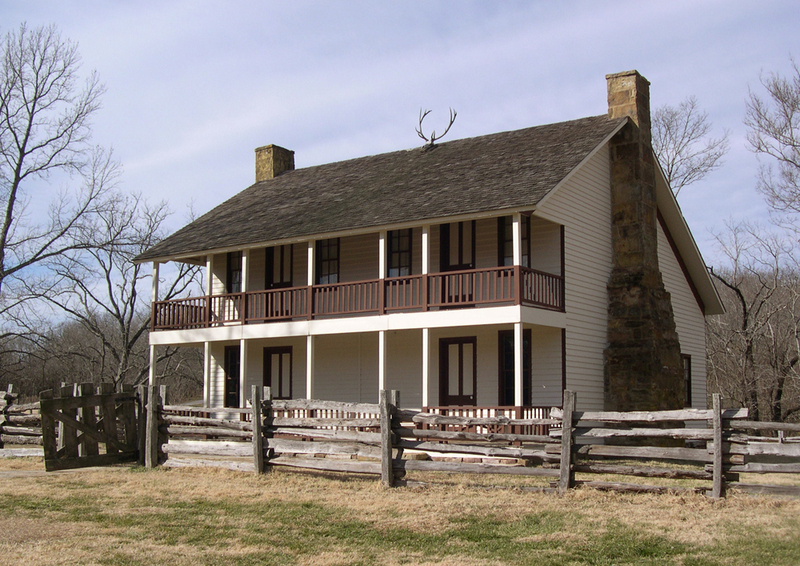 The outnumbered Federals gamely held their ground near a two-story hostelry known locally as Elkhorn Tavern. By nightfall, the Federals were forced back about ¾ of a mile where they spent a cold, wet, cheerless night in a muddy cornfield. The Battle of Pea Ridge, often erroneously referred to as the largest battle west of the Mississippi, was in fact the most strategically decisive Civil War battle ever fought west of the great river. It crushed the best efforts of the Confederates to reestablish a presence in Missouri, guaranteeing that state’s political loyalty to the Union. From a military standpoint, it permanently shifted the balance of power in the region to the Union, making possible other larger campaigns for control of the strategic Mississippi River. 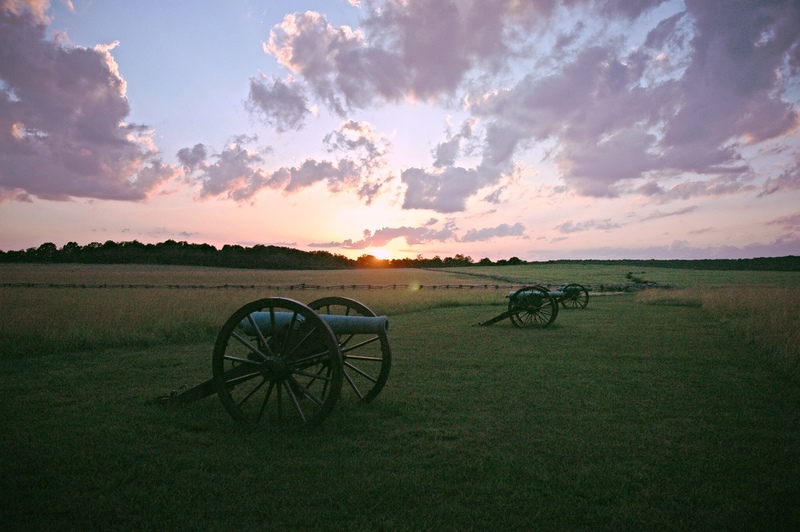 For more information, visit the Pea Ridge National Military Park website.